Your thyroid is a butterfly-shaped gland in your neck, just above your collarbone. It is one of your endocrine glands, which make hormones. Thyroid hormones control the rate of many activities in your body. They include how fast you burn calories and how fast your heart beats. Thyroid tests check how well your thyroid is working. They are also used to diagnose and help find the cause of thyroid diseases such as hyperthyroidism and hypothyroidism. 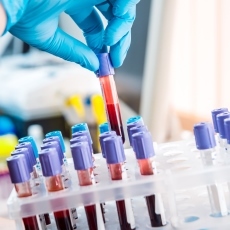 Thyroid tests include blood tests and imaging tests. TSH - measures thyroid-stimulating hormone. It is the most accurate measure of thyroid activity. T3 and T4 - measure different thyroid hormones. TSI - measures thyroid-stimulating immunoglobulin. Antithyroid antibody test - measures antibodies (markers in the blood). Imaging tests include CT scans, ultrasound, and nuclear medicine tests. One type of nuclear medicine test is the thyroid scan. It uses small amounts of radioactive material to create a picture of the thyroid, showing its size, shape, and position. It can help find the cause of hyperthyroidism and check for thyroid nodules (lumps in the thyroid). Another nuclear test is the radioactive iodine uptake test, or thyroid uptake test. It checks how well your thyroid is working and can help find the cause of hyperthyroidism. Article: Neonatal Thyroid Disease: Testing and Management.